Choosing the right color for you coat can be a tiny problem for you. Black is a color that you can never be wrong with, but if you want to stand out from the crowd you may consider buying a coat in some other shade, for instance a grey one. Grey is one of the colors that always take the stage during winter time, so why not try to make a statement with a grey coat. Below, we have chosen several Trendy Street Style Looks With Grey Coats that may get you inspired to get yourself some grey coat for this season. Grey is a neutral color which means that it can work well with almost any other color. This is one of the reason why you won’t be wrong if you get yourself a nice grey coat and wear it all winter long. And don’t worry, grey is a color that will never get out of style, so you can wear this coat next winter too. Check out the outfit ideas now and choose which one you will copy. When it comes to choosing the right footwear to combine with a grey coat, you shouldn’t stick to wearing only grey shoes, so feel free to wear black and brown too. And when it comes to accessories, like scarves or beanies, you may consider choosing them to be in some other more vibrant shade, for instance some burgundy ones. Although you won’t be wrong if you choose a grey beanie or scarf. 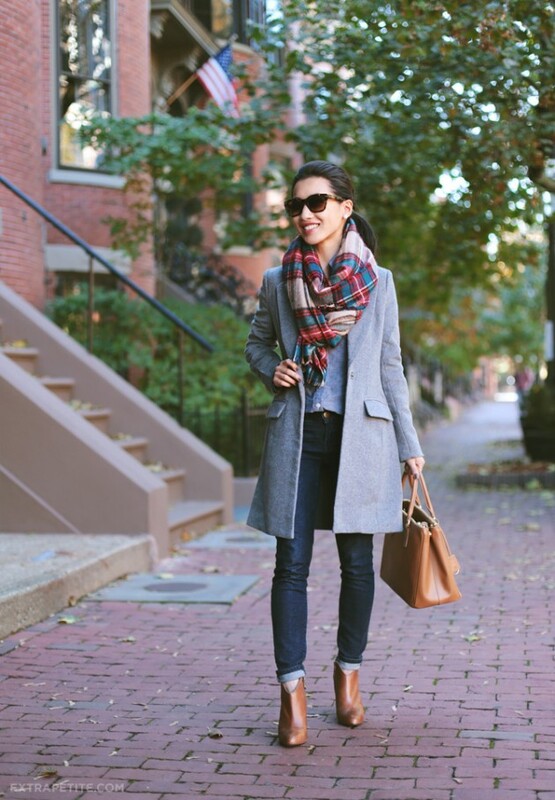 Also, a plaid scarf can look great with your grey coat. As we have already said, grey is a neutral color, so you can never be wrong with if you pair grey with the other neutral shades – black and white. Also, grey can look good in combo with pastel shades. These shades shouldn’t be overused during winter time, so choose to pair them with some grey coat. Scroll down now to see the rest of street style looks that we have chosen for you today and get inspired to wear a grey coat this winter. Grey coats can be found in versatile styles, so you will for sure find the right one for you. The above street styles looks should be your inspiration of how to wear your grey coat, so let us know in the comments which one you would like to copy. Thank you for reading and don’t forget to stay up to date with the content of Fashionsy to find many other street style looks for your outfit combinations.